Common River, an NGO based in Mill Valley, California, that we will be working with in Aleta Wondo, is an organization established by Tsegaye Bekele and Donna Sillan in 2007. Common River’s approach to empowering the people of Aleta Wondo is based on the “positive deviance” approach. This approach is based on the observation that in every community, there are individuals whose unique (“deviant”) behaviors create better (“positive”) results than their neighbor with the exact same resources. Common River seeks to amplify these behaviors to create a naturally sustainable and culturally appropriate community. The story really begins back in the 1940’s when Tsegaye parents helped found the town of Aleta Wondo and create jobs for the people. The family fled Ethiopia during the Ethiopian Civil War and eventually Tsegaye settled in California. 30 years after he fled Ethiopia, Tsegaye returned to visit his hometown and was shocked by what he saw. While he had moved on with his life, the people of his home community had not. Tsegaye was moved by Aleta Wondo’s great need and was determined to return to help them out. In 2006, Tsegay met Donna Sillan. Donna had decades of experience in international health development and consulting big NGO’s. Together they found a mutual interest in helping the people of Aleta Wondo. In April 2007, Tsegaye and Donna visited Aleta Wondo and spoke to numerous people on all levels of the community. They established three main areas on which Common River would focus: education, health, and livelihood. As they worked to develop the structure for Common River, Tsegaye also reclaimed some of the land that belonged to his family and donated it to the organization. They began by building a school for orphaned and vulnerable children and supporting the existing school. They then built a health care post that treated patients and taught the community preventative health care practices. The third component, livelihood, focused on creating a sustainable business development program, particularly the coffee-growing enterprise which is the main livelihood of the area. Last year, the 2009 team was the first group from UTHSCSA to work with Common River. This year we will return there to help out by providing check-ups, teaching preventative measure, and bringing medical supplies. 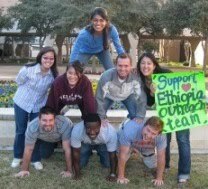 We go to Aleta Wondo representing UTHSCSA, the US, and the medical profession and hope to leave the people there with a positive impression. We also hope to gain a better understanding of how to serve others as well as an appreciation for Ethiopia, its people, and its culture. For more information about Common River, visit their website, http://www.commonriver.org/.